Don't know about you guys, but I do get little peckish around 10:30 to 11 AM when it's time for my second tea of the day, as I have my breakfast quite early in the morning. I always reach out for some sort of healthier food but occasionally reach out for a biscuit or Indian savoury snacks such as Farsi Poori or Shakkar Para. Sometimes, I grab some fruit, or piece of toast with few nuts. However, haven't had sandwiches with a morning cuppa before, for us Brits, sandwiches are meant for lunch or afternoon tea, although I may have already had thousands of sandwiches by now, my favourite is Yogurt and Herb Sandwich. So When I saw Usha's Mini Cucumber Sandwiches for elevenses, I was pretty excited to try it out for our monthly event called 'Food Bloggers Recipe Swap' Also, I had one more reason to make this recipe because it's made using white bread, we have not bought or made white bread in a long time in my kitchen. Just cravings! Well, it is almost a British teatime tradition, but actually isn't that old. According to historian Bruce Richardson who specialised in British tea, this concept may have popped up in the 20th century because there's no reference to the term in 1800s literature. Nonetheless, elevenses is strongly ingrained in today's British culture. In a day around 11am, it is the most popular short meal break taken known as elevenses, which comes after proper breakfast and before proper lunch. This break is taken by many people from all walks of life. Usually, one or two types of delicious snacks such as biscuits, cookies or a slice of cake and a cup of tea or coffee are taken. Although elevenses menu consists of biscuits, cakes and muffins, I don't mind something savoury for breaks like elevenses. Then why not Cream Cheese and Cucumber Sandwich! 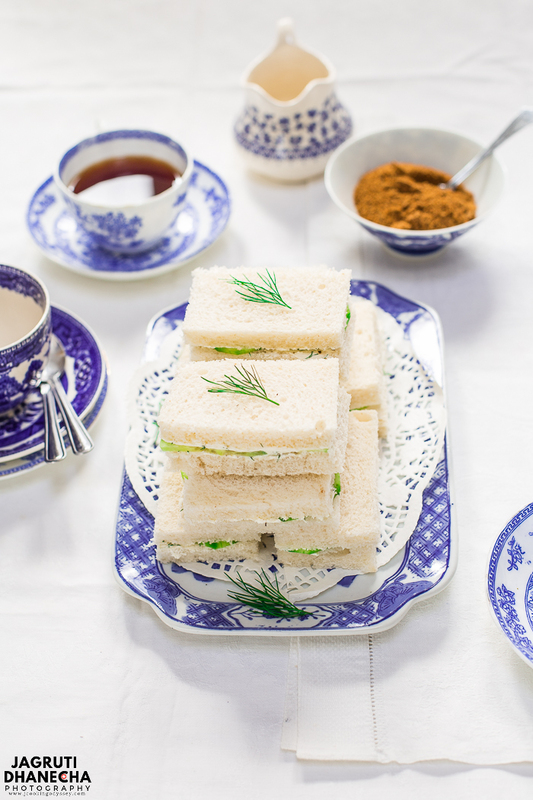 These quintessentially English sandwiches are considered as high society food, and it is simple to make but ridiculously tasty. They are great for luncheons, elevenses, afternoon tea or picnic. These sandwiches composed of delicious spread that is combined of two ingredients, cream cheese and herb and topped with refreshing paper-thin cucumbers a refreshing bite between crustless white bread. 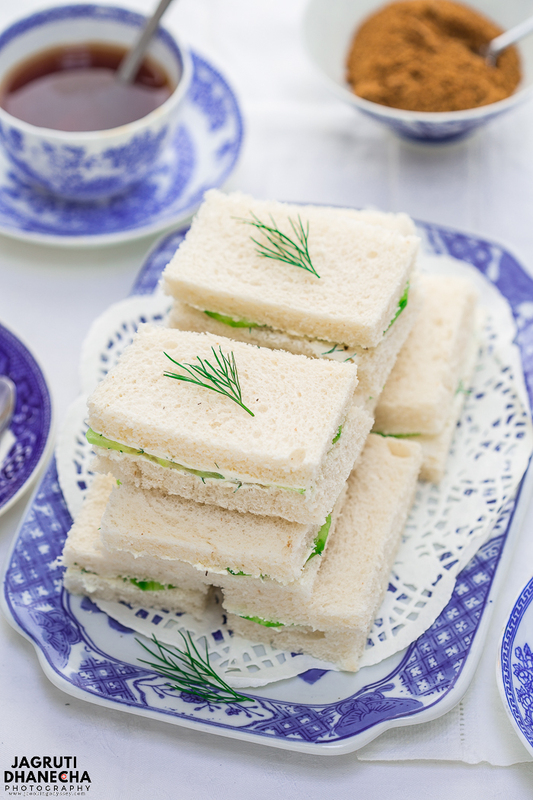 These finger sandwiches makes the perfect appetizer, snack or excellent Brtish garden party, and liked by old and young as they are light and refreshing. Bread - First and most important ingredients of these sandwiches is bread, traditionally white bread is more suitable, but whole grain is absolutely fine too. The bread must be extremely soft, softness is most important for a delicious sandwich. Dairy - Plain full fat cream cheese and butter plays a big role in for the yummy and tasty sandwiches. Cucumber - English cucumber is most favourite for this recipe as the seeds are small and delicate. In the traditional recipe, the cucumber must be peeled and thinly sliced (almost paper thin). But if you keep the peel on, it won't harm but only adds fibre in your diet. Herbs - last but the least important ingredient for this recipe is herbs, traditionally fresh dill leaves used for this recipe, but chives would be a great choice too. Seasoning - Freshly ground salt and black pepper. These are so simple and easy to make, you may want to include your young cook if you want. First I would start with the spread. Take cream cheese, dill and chives in a bowl, dried or fresh or skip totally. However fresh tastes so much better. Combine everything in a bowl and leave it aside. Once spread is done, make thin slices of the cucumber, in traditional recipe cucumber is peeled but once again if you prefer to leave it on, there is no harm in doing that. Now ready to assemble the sandwiches, evenly spread the cream cheese on a crustless white bread slice, place cucumber slices, sprinkle a bit of salt and pepper and top it up with another slice of bread. Cut it into the desired shape. Although I would love to make sandwiches at the time when I need it, one or the other reason if you need to make ahead, these sandwiches can be made up to 24 hours in advance. You want to make sure that each bread slice is fully covered with cream cheese spread, they won't get soggy at all ( when you spread any fat like butter, margarine or cream cheese on the bread slice, that layer of fat works as a barrier for the wet ingredients such as tomato and cucumber). Once prepared, cut into slices and store it in the container and seal well. Bring the sandwiches at the room temperature before serving. CAN I MAKE THESE SANDWICHES VEGAN AND GLUTEN FREE? Definitely, you can. Use vegan cream cheese and gluten free bread for this recipe. 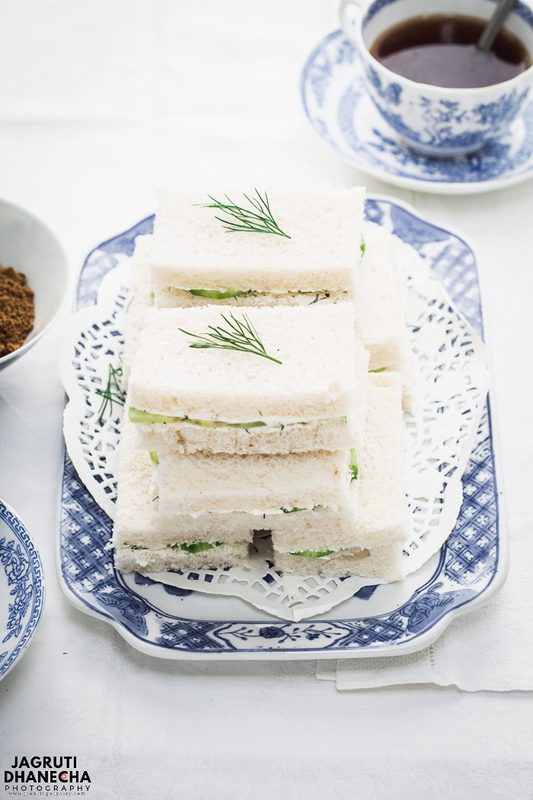 Easy and delicious cream cheese and cucumber sandwiches are perfect for afternoon tea, picnic or elevenses. In a bowl combine cream cheese and dill. Place the bread on a flat worktop, apply evenly butter and cream cheese on all the slices. Place cucumber slices and sprinkle salt and pepper on two slices. Top with the remaining slices on top, cream cheese side down. Gently press it and cut into the desired shape. Instead of dill, you can use chives or any other herb if you feel like it. Butter is optional, you can omit totally. Brown or multigrain bread can be used as long as it is fresh. Wow, photos are just amazing and beautifully styled. Serve ware is just perfect for this British sandwich. Thanks for trying. I don't use much of cream cheese in my kitchen, but now I am sorely tempted to, to make these sandwiches! :) They look so dainty, so cute, so delicious! This looks wonderful! I’m always looking for a snack food to go with my tea - I can definitely see making these! 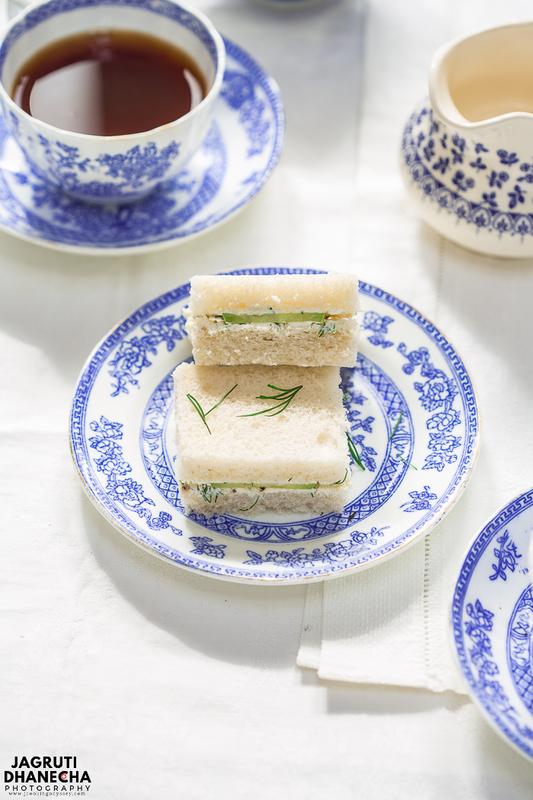 I used to work at a tea house where we served classic British tea service and this staple was always one of our trio of mini sandwiches we served. I often made an extra one for myself when I was making a tray for a customer. They are so simple and so delicious. Yours looks so good and it has been so long since I had them I think I am going to make them again soon now! These are such simple sandwiches but with great flavors. I am now tempted to make some soon for my boys. They would love this their school lunch or as an after school snack. I simply love these sandwiches and they look so cute with full of flavours. My kids will definitely enjoy this. Thanks for the lovely share.